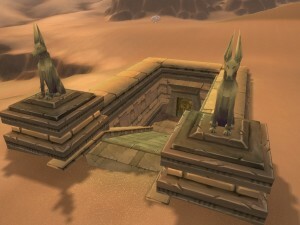 Episode #35 Timecapsule: Earning the mysterious Reins of the Grey Camel Mount is a monumental feat for all Azeroth explorers. This elusive riding mount can only be obtained by finding one of Uldum’s Mysterious Camel Figurines, teleporting to the secret Steam Pools sub-zone, and defeating a WoW World mini-boss, named Dormus the Camel Hoarder. With some patience – and a lot of luck – the Reins of the Grey Camel can become part of your collection of Cataclysm mounts. This entry was posted	on Tuesday, January 18th, 2011 at 7:46 pm	and is filed under Podcast Episodes. You can follow any responses to this entry through the RSS 2.0 feed. You can skip to the end and leave a response. Pinging is currently not allowed. Hey thanks for this, I never knew about it in WoW.